A Connection request screen may appear on your device the very first time you connect to our servers. 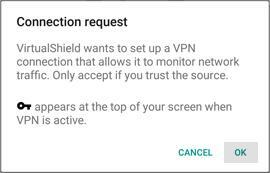 Tapping the OK button will grant permissions to VirtualShield and establish the VPN connection. A key symbol will appear at the top of your screen once you're connected. Disable any screen dimming or battery saver apps first and then try again. We have confirmed that Night Mode, Night Owl, Twilight, Lux Brightness and Screen Filter are among the apps that can cause this issue. Note: The "Connection request" screen may also appear if you disconnect VirtualShield from outside of the app. To avoid this, always disconnect from within the app by tapping the same button you used to connect.